On a recent trip to India I had a meeting with a director of a leading Indian motor manufacturer. It gave many insights into relevant issues in the industry but the most striking was a much more general observation. We were discussing - as is an inevitable topic of conversation with any foreign business figure - the deplorable state of Heathrow airport. This led to a discussion about the relative merits of various US airports which were considered preferable. Note the structure of the thought. He automatically considered the US and Europe on a lower standard of comparison than the most advanced Asian ones. Not that this applies, of course, to all Asian airports - Delhi or Mumbai themselves do not yet come up remotely to the best European or US standards. But he already internally judged that the highest levels set in Asia were on a far higher level than the US or Europe who had become 'poor cousins'. This from a leading business figure. Thirty years ago such a view would have been inconceivable. Today few outside Asia understand it exists. But it confirms once again just how much globalisation is not a purely economic process. It will transform perceptions as well. Not only an economic but a cultural earthquake is developing. 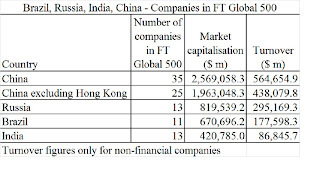 Most companies and commentators in the US and Europe, except at the very top, still greatly underestimate both the form and the scale of challenge that is coming not only from the BRIC economies but from Asia more generally. To some extent the economic power of Asia is understood - although even here there is still frequent underestimation of the scale of the shift taking place. But the way in which this will progressively spread into other fields is still not adequately grasped. This process is only beginning but it will continue to deepen. This concerns an academic area closest to business, MBAs, but sheer weight of money will make its way in the world. In the same way that, due to their dynamism, the Asian economies can outbid the US and Europe for oil they are able to outbid them for academic staff - greatly reinforcing their academic and cultural positions. This process is only at its beginning and, except in Japan, it will take a whole period to raise the 'stock' of Asian academic excellence, including in this the facilities available for research, to the same level as the US and Europe. But a number of Asian governments are consciously preparing this process. One of the most groundbreaking pieces of research carried out anywhere in the last period was the 'cultural audit' carried out by Shanghai - which London under Ken Livingstone took as a model for its own research in the field. This audit evidently underlay a systematic plan by Shanghai to raise its academic and cultural investment over a prolonged period - with the short term focus being strengthening its position in creative industries. The conclusion of the audit was that to achieve this Shanghai must undertake large scale investment over a prolonged period. But China has entirely adequate resources for this. In the cultural and academic fields, compared to the economic, the shift in favour of Asia is only just beginning but is consequences will be deep. The rise of a limited number of ‘international financial super cities’ is a not an accidental but a necessary phenomenon in the modern globalised world economy. The two most striking examples of this development are London and New York – the world’s two largest international financial and business service centres. Tokyo had the opportunity, in terms of the depths of its capital markets, to develop as an international financial centre to fully match New York or London. But it failed to do so due to mistakes in policy that will be examined in future posts. The result has been to create a space for an Asian financial centre to rival New York or London. The competition to settle which this will be is not yet resolved. The Chinese government is encouraging a number of its cities to develop projects to become such a centre. The objective possibilities of various Asian cities to become such a centre will be considered subsequently. The similarities of New York and London illustrate that certain features of the development of an international financial centre are not accidental but intrinsic to their its nature. Their advantages compared to rivals will be considered. A crucial feature is that while globalisation is rooted in the economy its effects cannot be confined to the economy. Any concept that countries will trade with each other more, and invest in each other’s countries more, but everything else will remain the same is entirely unrealistic and will decisively weaken the attempt to create a global financial centre. Globalisation has not only economic but major social, cultural and environmental consequences that an international financial centre must prepare for. One of the key strengths of London compared to Paris in the last period for example was that Paris's attitude to international companies was 'your money is very welcome but please leave your culture behind you.' London, in addition to the much greater strength of its financial markets, adopted the approach 'your money is certainly very welcome and we assume you are going to bring your culture with you - which will help make our city more creative and dynamic.' The cutting edge which London acquired in creative industries and culture, as well as its success in winning the Olympic Games, followed from that approach.